If you are planning for a tempting Thai lunch or dinner, then Thai fried rice a is a must have item in it. 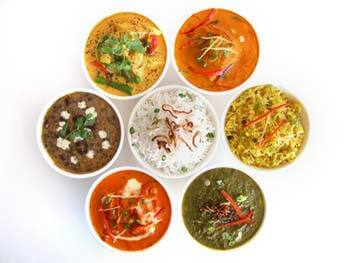 There are many variant of this rice recipe which include use of meat, chicken, seafood or eggs. However, this particular recipe is a pure vegetarian recipe and uses thai red curry paste and fresh vegetables along with steamed rice. Note: If you want to make green fried rice, then use Thai green curry paste and green chilli. In this recipe, Thai red curry paste and red chillies are used. Finely chop spring onion and cut baby corn and green bell pepper into thin slices. Heat oil in a wok or frying pan over medium heat. Add red curry paste and crushed red chilli, stir-fry for a minute. Add sliced baby corns and sliced bell pepper, stir-fry over medium flame for 2-3 minutes. Add chopped spring onion, soy sauce, white pepper powder and salt cook for a minute. Now add steamed rice and mix gently. Stir-fry for 1-2 minutes until all ingredients are well mixed. Serve red Thai Fried Rice with vegetable soup. For variation, add sliced tomatoes to get more tangy taste. While mixing steamed rice, stir gently otherwise they may become mushy. Use jasmine or brown jasmine rice for nice flavor. You can also add vegetables of your choice to make it tastier and healthier. 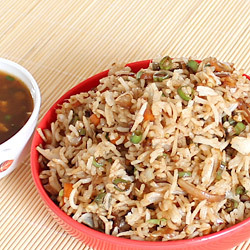 Serving Ideas: Serve veg thai fried rice in lunch or dinner.